EyeMark® takes fully automated diabetic retinopathy analysis one step beyond imaging, grading and reporting. It is designed to automatically and accurately track disease progression from visit to visit to determine if a patient’s disease has increased, decreased or remained stable. This information augments the “Positive/Negative” disease assessment that is available today and is valuable for disease management. 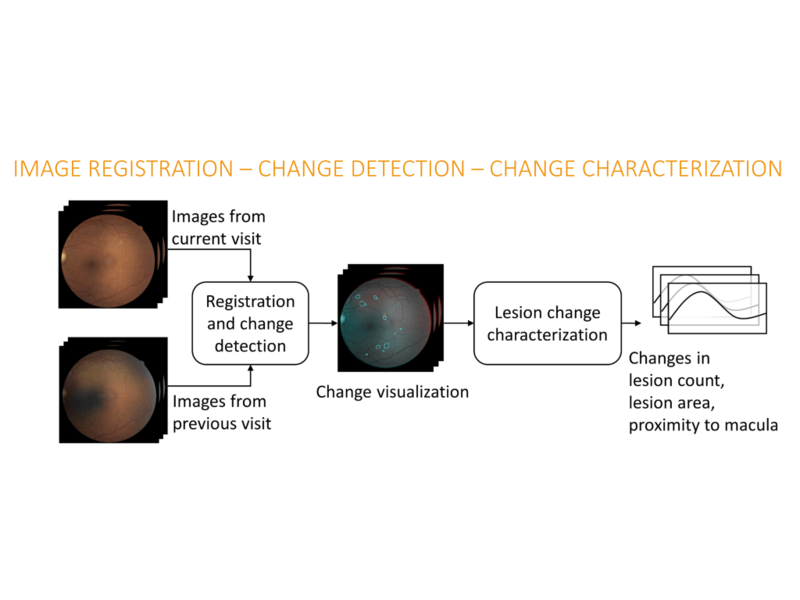 Internally, the technology contains the EyeDiff™ engine which (i) automatically registers the images from different visits of a patient, (ii) detects and localizes the lesions present, and (iii) displays the lesion change visualization, along with lesion count and area statistics. Following this, the EyeMark Change Detection engine estimates microaneurysm (MA) appearance and disappearance rates (known as turnover rates) for use as a biomarker in monitoring the progression of DR. Early studies have shown the promise of EyeMark and the technology is under active development. Funded in part by prestigious National Institute of Health (NIH/NCATS) grant TR000377 totaling ~$2.5 million USD. Clinical Evidence | Want to know more? Microaneurysms (MA) are the first signs of DR and are therefore of significant interest. MA turnover indicates MA appearance and disappearance rates. 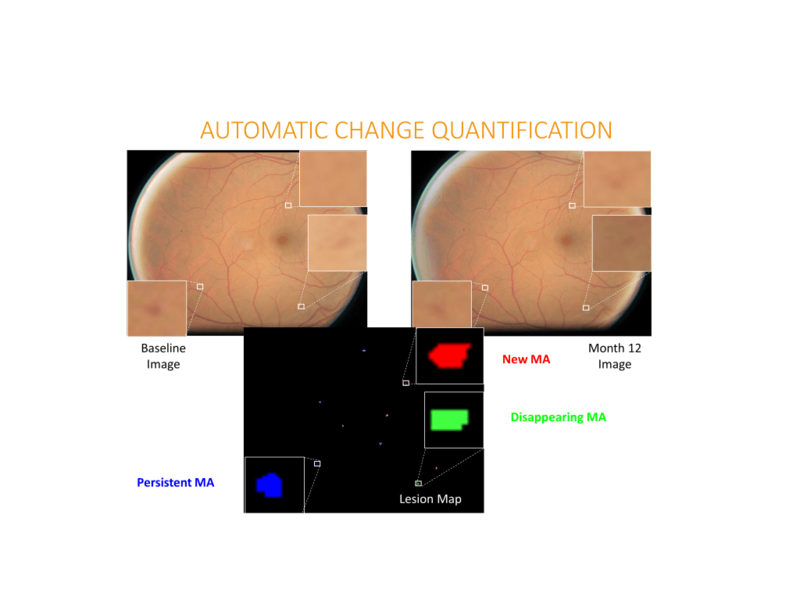 Studies have shown that MA turnover can be used as a biomarker for monitoring the progression of diabetic retinopathy. High MA turnover rates possibly indicate higher risk for DR progression. MA turnover measurement involves two steps: (i) careful alignment of current and baseline images, and (ii) marking of individual MAs. This process is very time consuming and prone to error, if done entirely by human graders. The problem is compounded by the variable image quality and inter- & intra-observer variability between screenings. EyeMark overcomes the above limitations by automating both the steps involved in MA turnover measurement: accurate image registration, and MA detection. 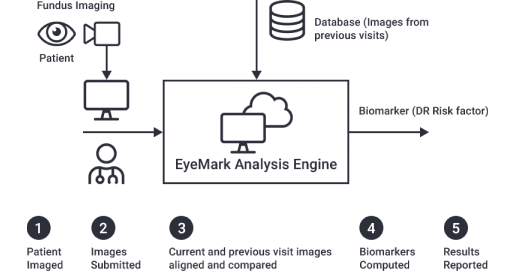 EyeMark is powered by advanced, multi-scale image registration algorithms that accurately aligns images of a patient across multiple visits and is robust to variations in image appearance and quality. It also includes state-of-the-art deep learning based lesion detection algorithms and proprietary hybrid change detection techniques that uses multi-scale morphological filtering with deep learning. 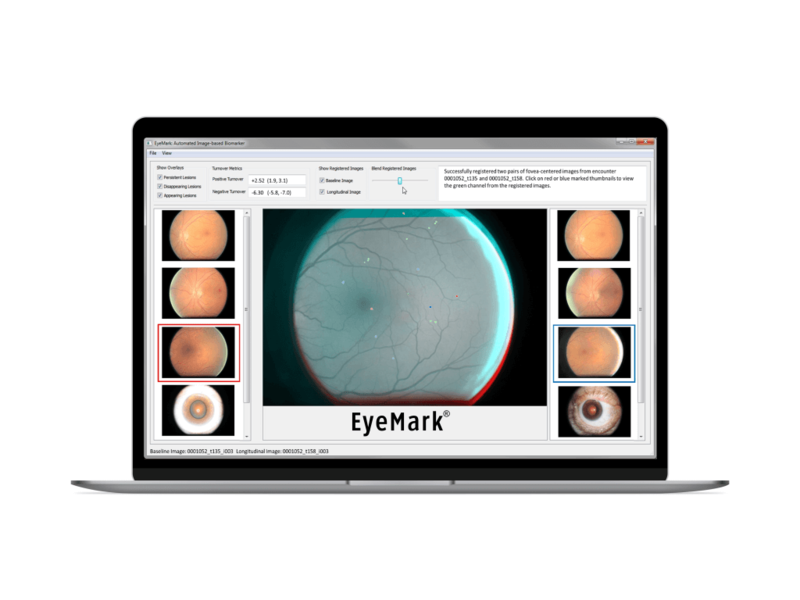 These technologies combined with an intuitive user interface make up EyeMark software. A visiting patient is imaged by an eye care professional using a commercial fundus camera and the fundus images are input to EyeMark. The software automatically analyzes and grades the images (for current visit and all available previous visits), intuitively displays the lesion change visualization, and issues a simple, quantitative report. EyeApp™ is designed to enable any health care provider to conduct diabetic retinopathy screening using portable, low cost fundus cameras. 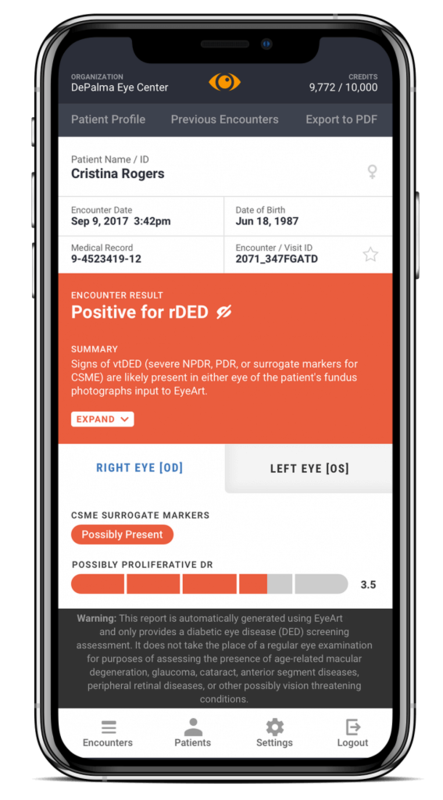 EyeApp can run on the smartphone that is often packaged with these camera solutions and can provide end-to-end DR screening without the need for expensive tabletop equipment. This technology offers the potential to greatly increase the number of patients that can be screened and reduce blindness due to diabetic retinopathy (DR). Studies show that in 90% of cases of vision loss can be prevented if DR is diagnosed at an early stage. Since DR progresses without any pain or discomfort, screening every diabetic for DR via retinal imaging or examination is the only way to identify patients for treatment. In order to screen the estimated 425 million diabetics worldwide for preventable blindness due to DR, and for this screening to scale as the diabetic population grows to over 629 million by the year 2045, computerized diabetic retinopathy screening must be deployed at massive scales and made accessible. EyeApp is powered by the same robust technology that powers EyeArt®. Our image analysis algorithms represent cutting-edge of research in image processing, computer vision, and machine learning. 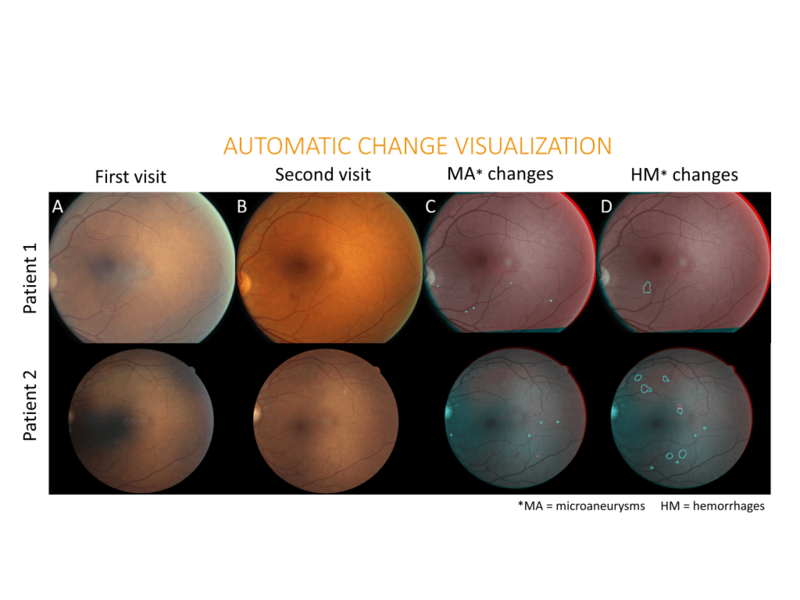 Technological innovations like morphology-inspired filter bank descriptors can automatically analyze fundus images to detect and localize lesions resulting from diabetic retinopathy. Combined with deep learning techniques, they can help accurately triage patients at risk of vision loss due to diabetic retinopathy. EyeSee® AMD is designed to be a fully automated retinal imaging analysis technology to identify age-related macular degeneration (AMD), the number-one cause of legal blindness in seniors. EyeSee AMD will fully automate the screening, grading and reporting process for AMD, without need for a human grader and with high sensitivity and specificity. 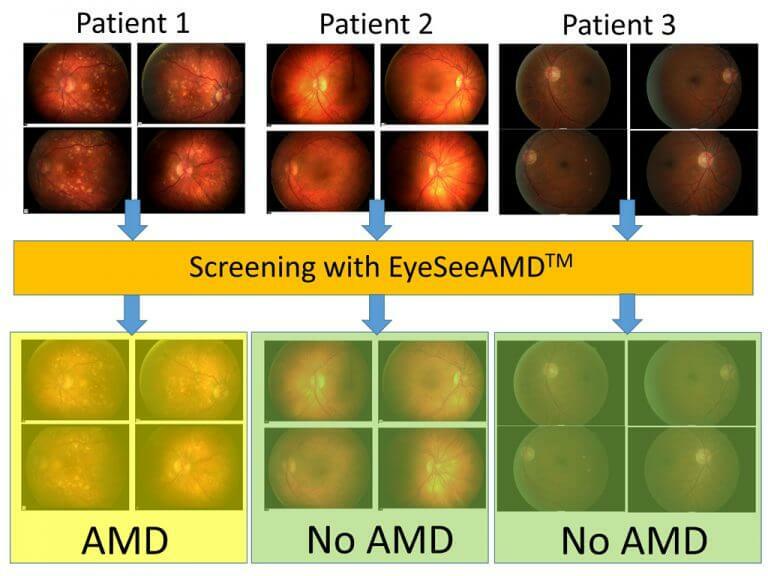 This will enable even a primary eye care provider or optometrist to screen for AMD, which is possible today only in a specialist’s office, offering the potential to identify and treat far more patients than is possible today. 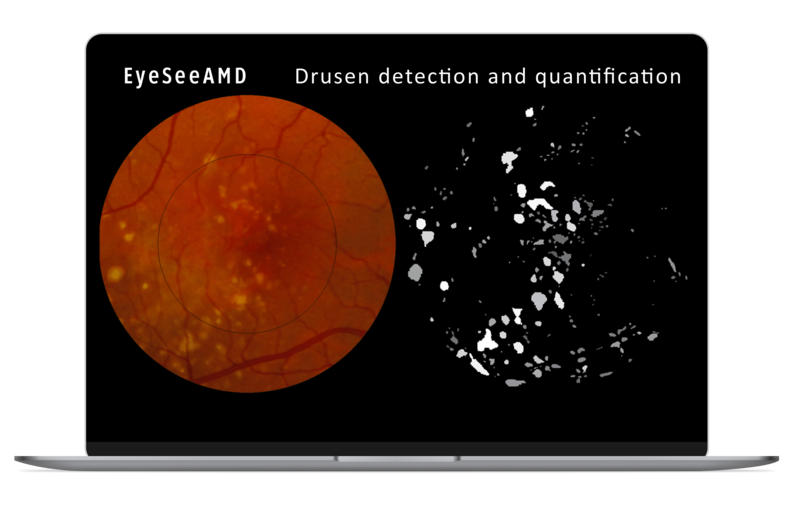 The EyeSee AMD uses proprietary image analysis technology for identification and quantification of drusen – deposits under the retina that are indicators of AMD – viewable in color fundus images. Promising early results were published in the IOVS Journal from ARVO. Age-related macular degeneration (AMD) is the single largest cause for legal blindness among senior Americans. Non-neovascular or dry (atrophic) AMD is the primary form of AMD contributing to 85% of the AMD cases and may be asymptomatic or result in a gradual vision loss. The largest and most impactful dry AMD studies - Age-Related Eye Disease study (AREDS) and Age-Related Eye Disease study 2 (AREDS2) - have shown that vitamin supplements along with minerals and antioxidants slow progression of the disease in patients with intermediate AMD, and those with late AMD in one eye. But without a straightforward, reliable way to screen for these vulnerable patients, early detection and treatment will remain a problem. Our image analysis algorithms represent cutting-edge of research in image processing, computer vision, and machine learning. 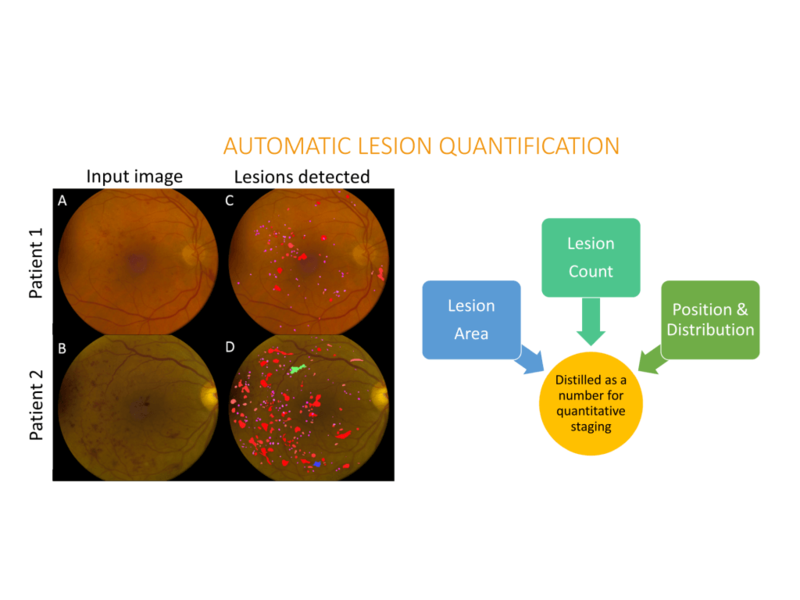 Technological innovations like morphology-inspired filter bank descriptors combined with deep learning can automatically analyze fundus images to detect and localize lesions resulting from AMD. EyeSee® Glaucoma is designed to automatically analyze retinal images to determine the presence of Glaucoma. EyeSee Glaucoma can enable screening, grading, and reporting for Glaucoma directly at the point-of-care without the need for a human expert to grade the images. This will make glaucoma screening more accessible. Today, testing for Glaucoma not only includes retinal images but also other procedures such as tonometry and perimetry testing. 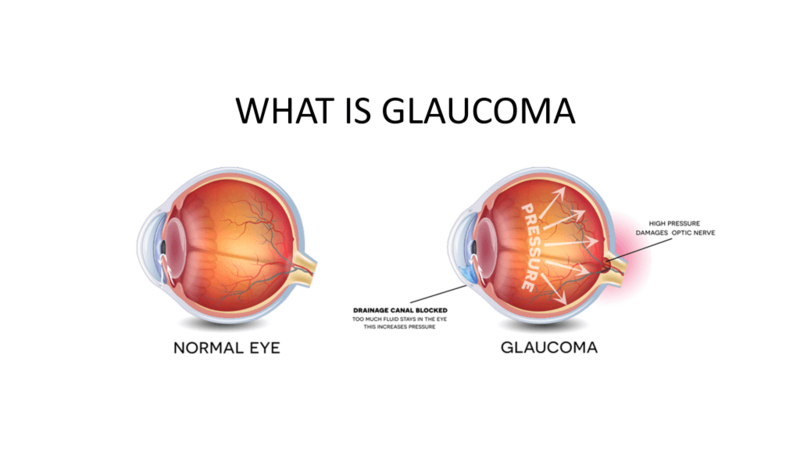 EyeSee Glaucoma is designed to augment information from additional tests, if available, to provide improved performance.